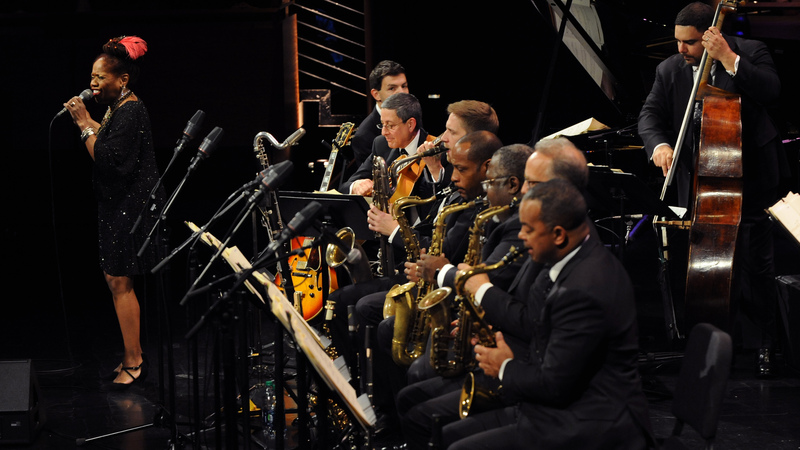 The Jazz at Lincoln Center Orchestra featuring Wynton Marsalis is back with lively arrangements of holiday classics like "Jingle Bells" and "White Christmas." Catherine Russell joins the orchestra as a guest vocalist. Wynton Marsalis (music director, trumpet), Greg Gisbert (trumpet), Kenny Rampton (trumpet), Marcus Printup (trumpet), Vincent Gardner (trombone), Chris Crenshaw (trombone), Sam Chess (trombone), Sherman Irby (alto saxophone), Ted Nash (alto saxophone), Victor Goines (tenor saxophone), Walter Blanding (tenor saxophone), Paul Nedzela (baritone saxophone), James Chirillo (guitar), Dan Nimmer (piano), Carlos Henriquez (bass), Marion Felder (drums), Catherine Russell (vocals). Note: These comment boards are available to the general public. Statements expressed in the comment boards do not necessarily reflect WBGO's views. The inclusion of any links does not necessarily imply a recommendation or endorsement of the views expressed within them. For more information, please read our Terms of Service. The easiest and most convenient way to catch up with the latest blog posts is to subscribe to WBGO's Blog RSS Feed.